The world has been conquered by hakka, schezuan and noodles. The elite dribbled with sushi and pad thai. A few outliers showed off their liking for bun cha. Hence, I didn’t think much of Korean cuisine since I was happy with Chinese, Thai, Malaysian, bits of Japanese and Vietnamese. I knew they used a lot of garlic, when I met Chan from Korea while finishing high school. Not because he said so, but because he smelled of garlic all the time. 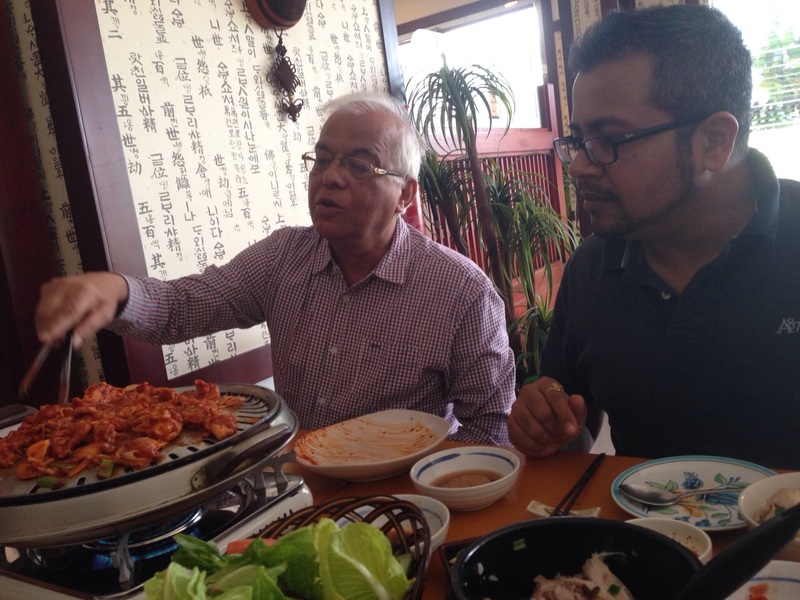 Years later, my globe-trotting father-in-law mentioned Korean grub while he was making ‘khimchi’ at his New Delhi home. Adding some fuel to the Korean fire was my friend and fellow food blogger Gopika who wanted to try Korean after she got hooked to their TV serials (there is a connection here). So, wife and I, along with my father-in-law (who is visiting us) decided to hop over to Koreana in Al Barsha, next to Al Zahra Hospital. This has been a totally educational outing and I took my FIL’s direction and recommendation. The restaurant reminded me of the Far East as seen in umpteen films and comics. The menu was an extensive, bi-lingual booklet with occasional pictures just so that you know what the tongue-twister looked like. 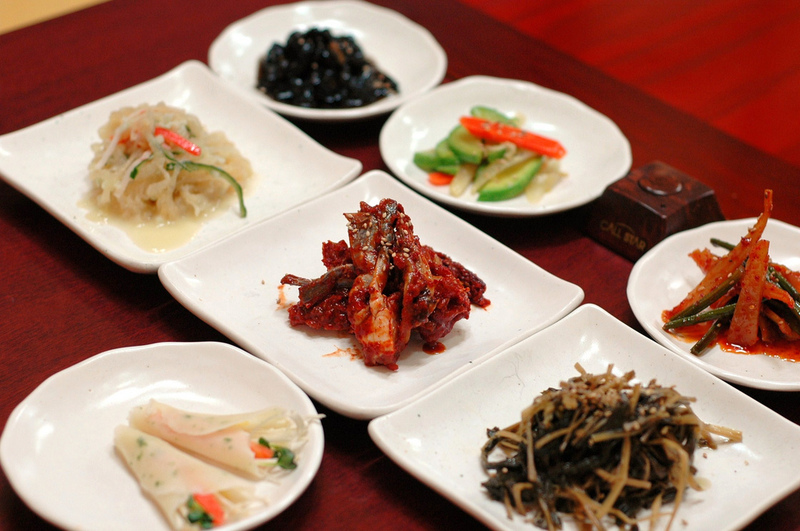 First up, six side dishes or ‘banchan’ were plated, complimentary. It consisted of ‘khimchi’ – fermented cabbage with overpowering garlic. Other dishes were spinach with sesame seeds, ‘namul’ – spicy bean sprouts, egg-plant in brown sauce and soy potato is sweet honey broth. I was happily attacking each banchan with my flat steel chopsticks while FIL finalised the order. We started off with steamed chicken dumplings. If you are holding on to any Chinese taste in your head, then you are in the wrong restaurant. The dumplings were served with a mixed dark sauce that was primarily soy with a hint of sweetness. Dunked dumplings tasted perfect. 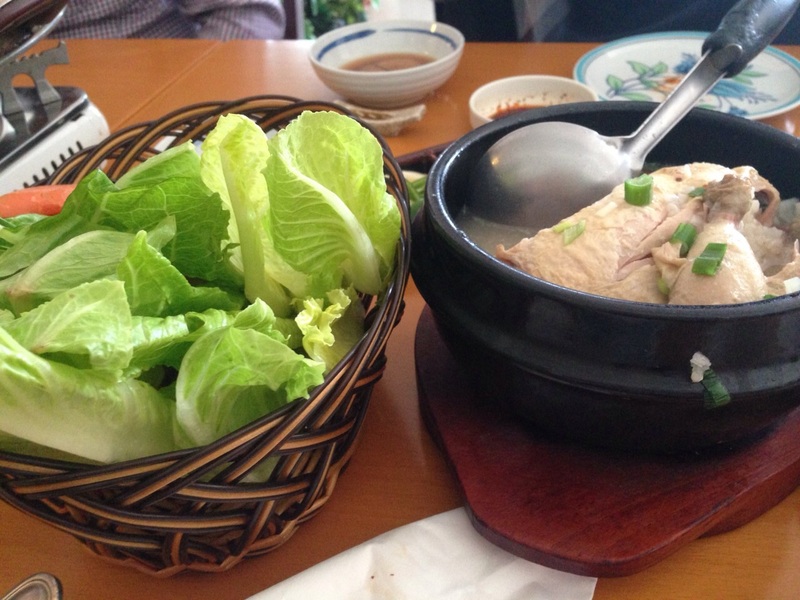 Next up was Samgyetang – a one-pot dish that is braised chicken stuffed with ginseng and sweet rice. The flesh falls off the bone with the slightest touch of cutlery. Chicken soup for the soul and chicken / rice for all else. If you are nursing a flu or a broken heart, Samgyetang will heal it. 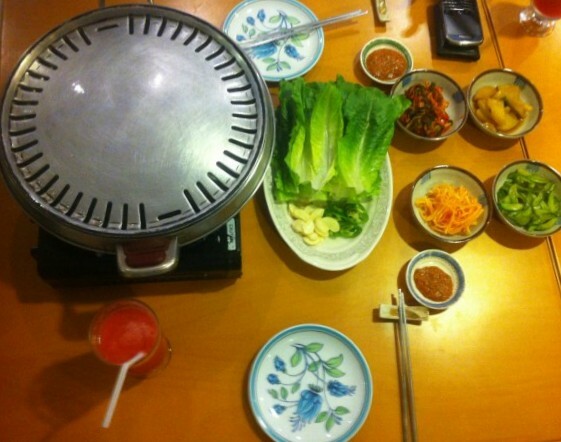 Meanwhile, the table was set for the next dish – spicy pan-fried chicken. the grill was set, crunchy lettuce leaves arranged, freshly cut garlic and peppers promised the extra heat along with a tangy, nutty, spicy sauce. Chicken strips, onions and greens, happily marinated in a sweet chilli marinade was spread over the sizzling hot grill. One can grill it the way one wants. The extra batter started caramelising and we started arranging it to eat – chicken strips in the lap of lettuce, add in the garlic and pepper, add a touch of the sauce, fold up the lettuce taco and eat it. If you do not have any words, then don’t blame yourself – it is very good indeed. 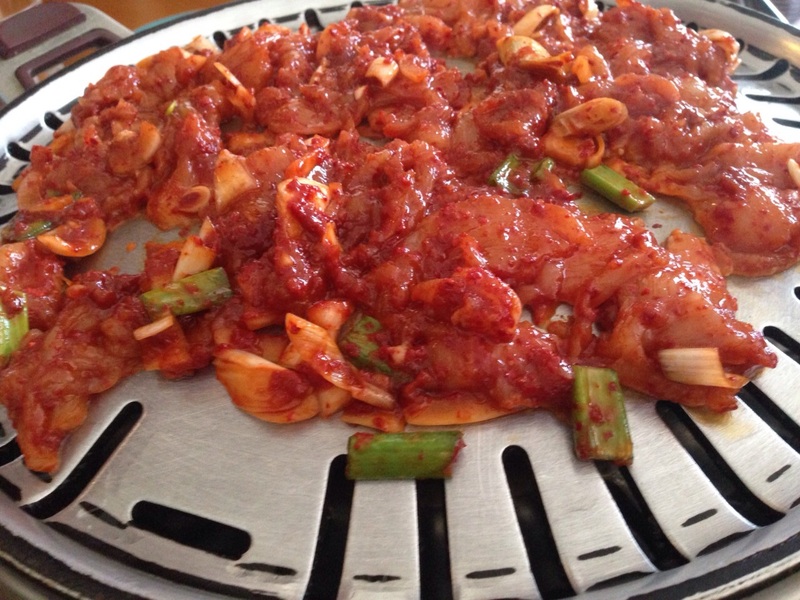 In Korea, this grill is more popular with beef than chicken. You can try it with prawns too, just dont leave them on the grill for too long. A meal for 3 cost us approx AED 180. Dont bother picking up a menu – there isnt home delivery and thankfully so. Some things need to be eaten in restaurants. Sumptuous and satiated, I am now adding some Korean to my gastro-repertoire. Gamsahabnida!